What are the criteria that define the quality of pu-erh tea? How do we choose the right quality? Every year, I regularly visit Yunnan and stay there for a few weeks. In this article, I would like to share my experiences with you. 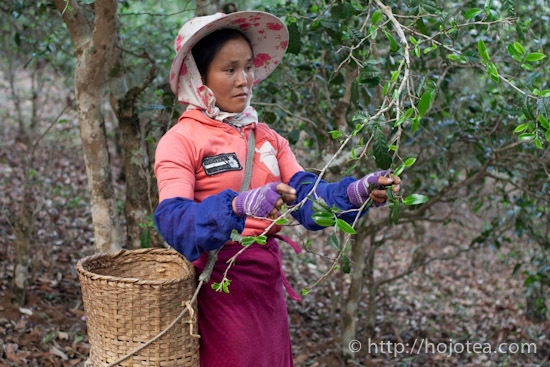 Historically, pu-erh tea was produced by the minority ethnics for their own consumption. Sometimes it was exported to Tibet, Mongolia or South East Asia. pu-erh tea was an important commodity trade where the Chinese merchants hired the local labourers as transporters and the pu-erh tea was carried and traded for horses or other commodities. 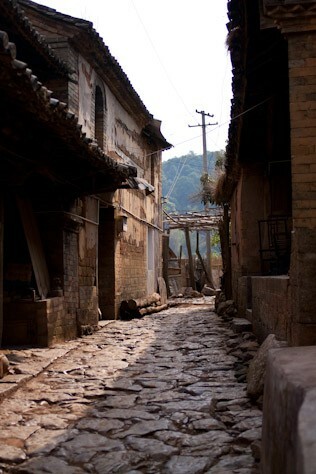 The road used for this trade was called “The Ancient Tea Route” (茶馬古道). It is sometimes deemed as the second Silk Road as it was a very important commercial route for them. Xishuang Banna is situated on the Southern end of Yunnan and it is located at the borders of Myanmar, Vietnam and Laos. The name of “Xishuang Banna” is originated from Thai language. The ancient route of Tea and Horse started from the Southern end of Xishuang Banna, a town called Yiwu (易武), and it continued up to the North. Tea was once stocked and gathered at a town called pu-erh (普洱) which is the hub for pu-erh tea trading and logistics. This is why the minorities’ tea was named as pu-erh. 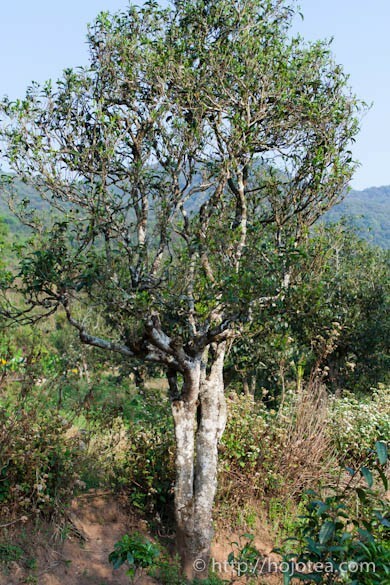 In Yunnan, we can still find a lot of old tea trees that are aged to about a few hundred years and where some are even aged up to a thousand years old or more. 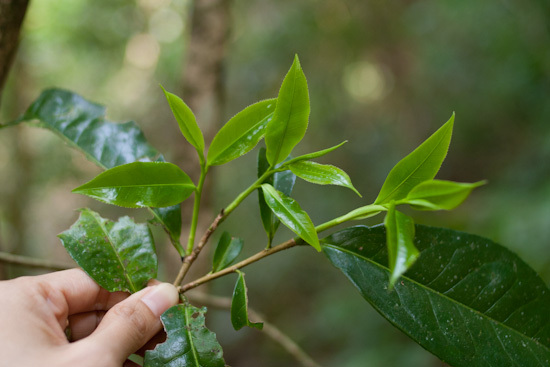 Sometimes people may misunderstand that pu-erh tea was produced since more than thousands of years ago due to a number of old trees found in Yunnan. Well, it is not true. During the very early stage, that was, more than 2000 years ago, tea was already a commodity trade in Yunnan and it was exported through the ancient tea route. 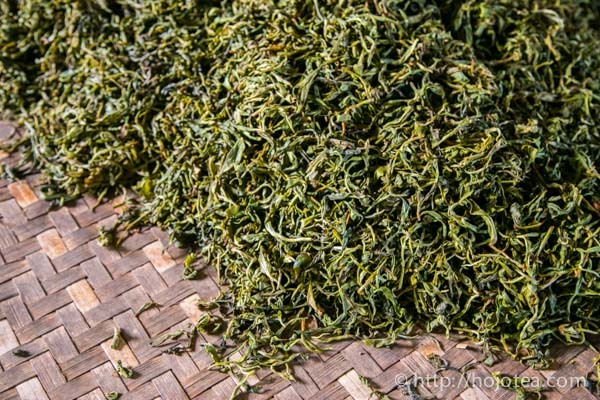 At that time, fresh tea leaves were plucked and then just dried. 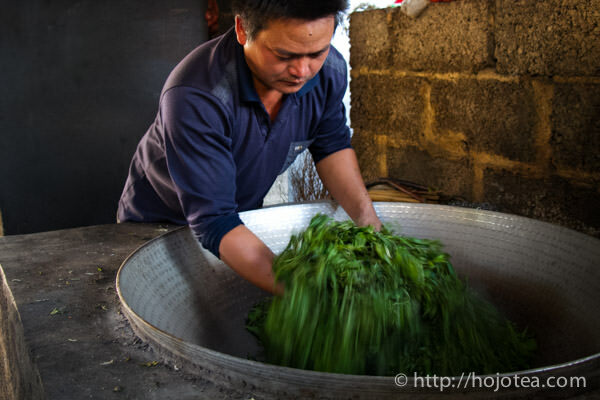 There were no contemporary tea processing steps involved, such as, no pan-frying process or rolling process. Since the Han dynasty, the tea was dried and compressed without any additional processes. The raw pu-erh tea was invented and introduced during the dynasty of Ming which was about 700-800 years ago. As for the ripe pu-erh tea, it was invented in the 1970s. The history of ripe pu-erh tea is even shorter than my age. All the tall trees are the tea tree. Drinking pu-erh tea became a fashionable lifestyle in the past decade where tea collectors from Guangzhou, Hong Kong and Taiwan triggered the boom of pu-erh. In 2006-2007, as pu-erh’s market price skyrocketed to a new peak, an overwhelming quantity of poor quality teas was produced and flooded the market. 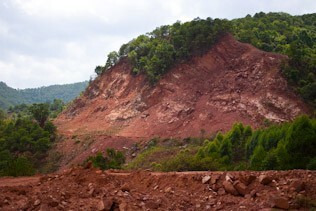 In 2008, the pu-erh boom suddenly cooled down as quick as it started and now it is over in China. Now is the ideal condition, since the price is lower and the poor quality tea has been rejected by the market. 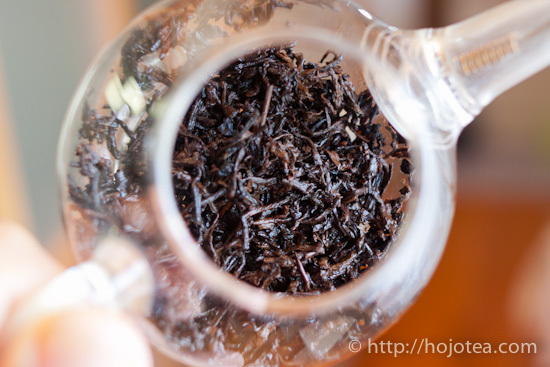 The pu-erh tea consists of two completely different categories. One is called “Raw pu-erh Tea” and another is “Ripe pu-erh Tea”. Usually a tea beginner appreciates ripe pu-erh tea more while the experts and collectors appreciate raw pu-erh tea better. 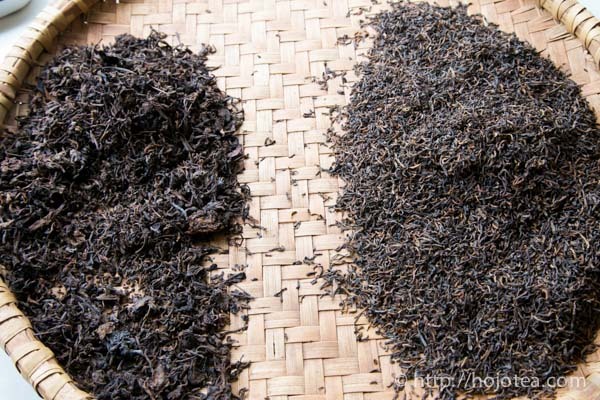 However, from the process point of view, raw pu-erh tea and ripe pu-erh tea are completely two different types of tea. Raw pu-erh tea has a very long history and it was the tea traded through The Ancient Tea Route. Raw pu-erh tea is also the tea that many tea collectors are enthusiastically searching for. Freshly produced raw pu-erh tea. This form of leaf is called Mao-cha. 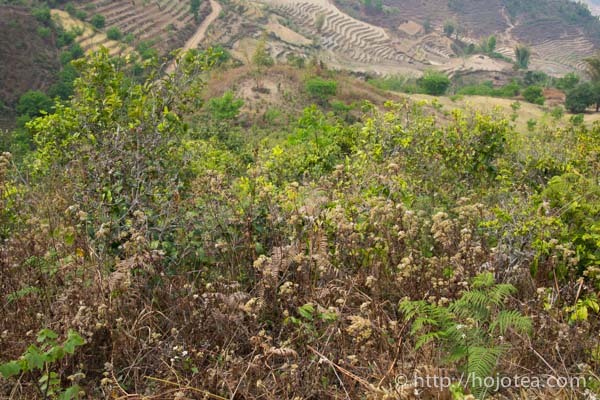 Ripe pu-erh has a much shorter history compared to raw pu-erh. Ripe pu-erh was developed in 1973-1974 at Kunming Tea Factory (昆明茶厂) with reference to the process of ancient dark tea, such as Fuzhuan Cha, that is produced by mold fermentation. 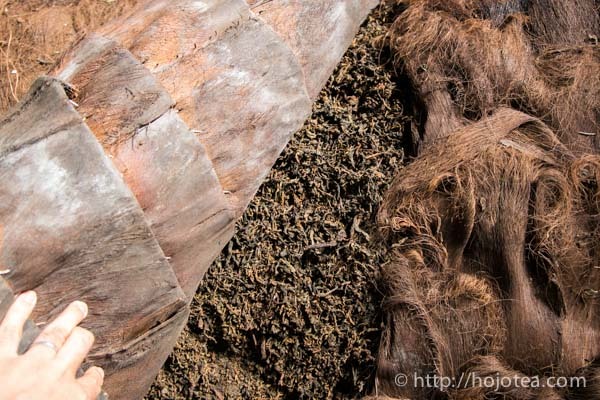 While the tea undergoes fermentation, the mold produces a certain organic acid that causes the pH of the tea to reduced resulting in a complete fermentation within a much shorter duration. Hence, the colour of the tea leaves changes to dark brown and produces a mellow taste with thick body. The good quality ripe pu-erh gives out a flavour like dried Chinese dates. In overseas market, ripe pu-erh is generally more popular. 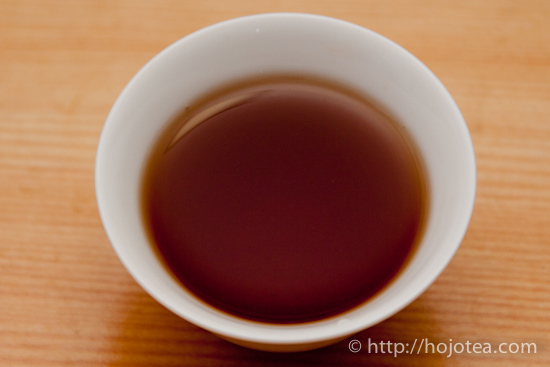 The liquor color of the ripe pu-erh is dark-brown-red. 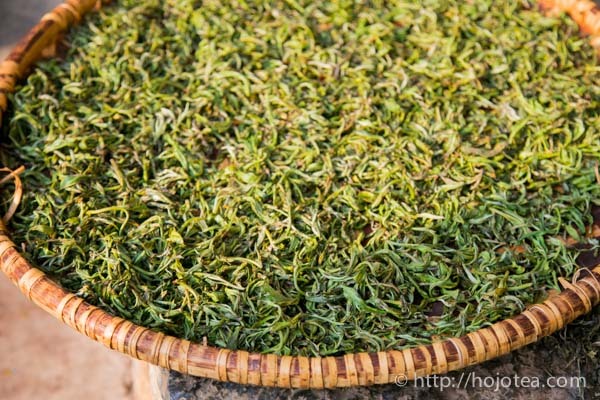 The brewed tea leaves of ripe pu-erh tea. Basically, raw pu-erh tea-making process is similar to that of green tea. But it is not identical. Firstly, the plucking standard is different. 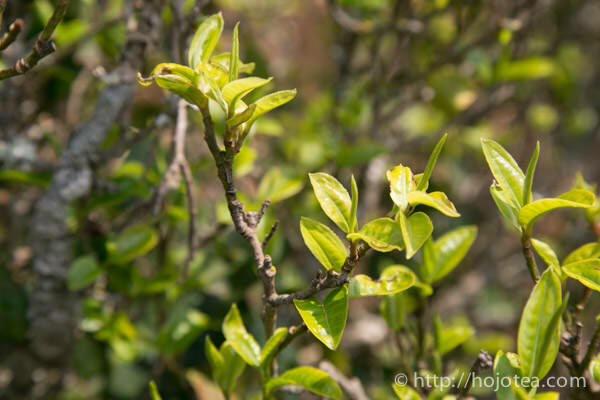 For pu-erh, normally one bud and 3-4 leaves are plucked which is just like oolong tea. On the other hand, green tea is usually made of single bud and 1-2 leaves, but sometimes it is made of single buds. In fact, for further maturation of pu-erh, the 3rd leaf plays an important role in contributing to the floral note or fruity flavour. As compared to the 1st bud or 2nd leaf, the 3rd leaf has stayed much longer on the tree; hence the 3rd and 4th leaf is very rich in polyphenols and minerals. In order to get a strong flavour and aftertaste, the 3rd leaf is essential. 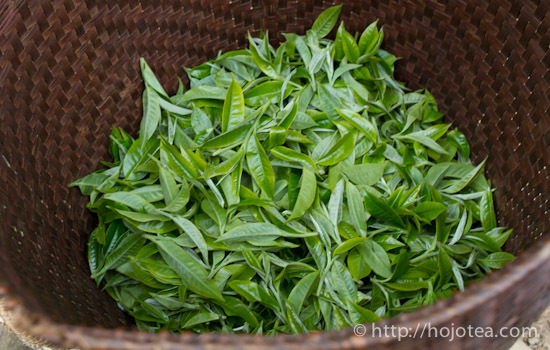 The plucked tea leaves are fried in a pan in order to deactivate enzymes. During the process of making pu-erh tea, pan-frying process does not completely deactivate enzymes, but some enzymes still remain alive. Unlike the making of Japanese green tea, the enzymes are completely deactivated due to the intense steaming with saturated steam. Chinese green tea should be of similar way as pu-erh, since it is also pan-fried. But Chinese green tea is subsequently dried with hot air which will eventually deactivate the remaining enzymes. The Video of pan-frying process is available. As for pu-erh, the tea leaves are not dried using the hot air, but it’s dried under the sun. Sunshine drying process assists the fermentation. Sunshine drying does not instantly increase the temperature of tea leaves which causes the remaining enzymes to be active. During sunshine drying process, the tea leaves are spontaneously fermented and produce a typical flavour of raw pu-erh tea. 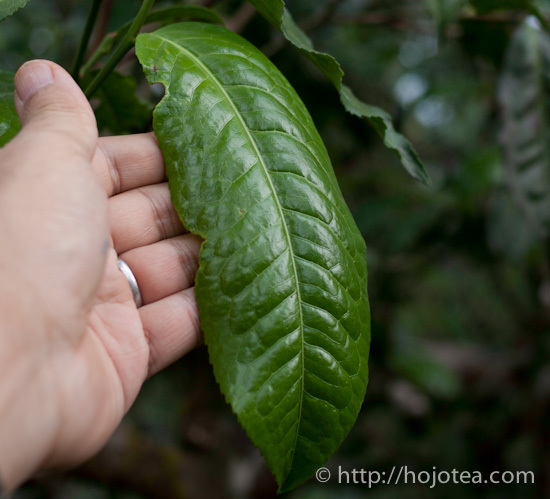 For freshly-made raw pu-erh, the tea leaves are still green. Therefore, if the pu-erh is kept for a longer period of time, the tea leaves will become yellow. The leaf of well-kept raw pu-erh tea does not really turn brown in colour. 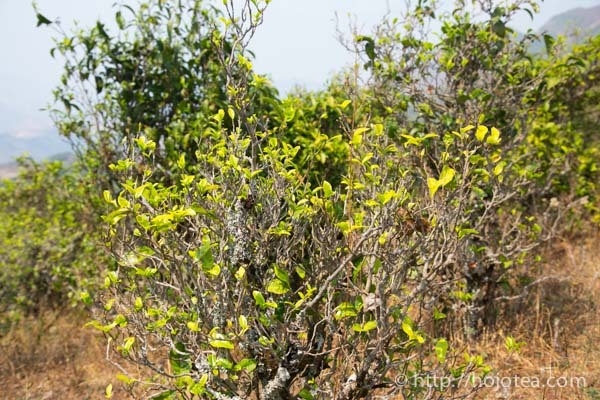 If the storing environment is well managed during the storage period, the tea leaves will remain yellow. The freshly-produced raw pu-erh tastes similar to that of green tea. 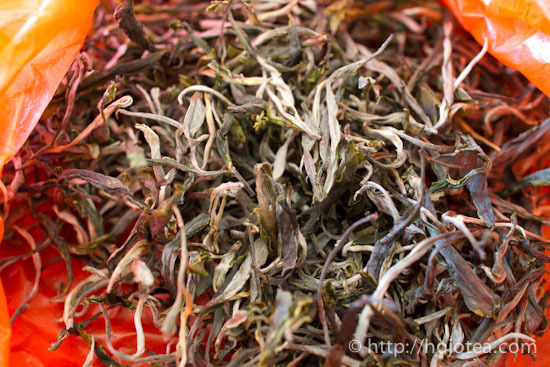 With moderate oxidation during storage, its characteristics become similar to that of white tea. With further oxidation, the characteristic of the tea turns slightly closer to oolong tea, and finally it becomes similar to black tea. Being able to discover changes in various taste and flavours found in the product of different storage years is the utmost satisfaction of indulging pu-erh. From the same identical batch of pu-erh, the flavour also differs depending on the storage method. 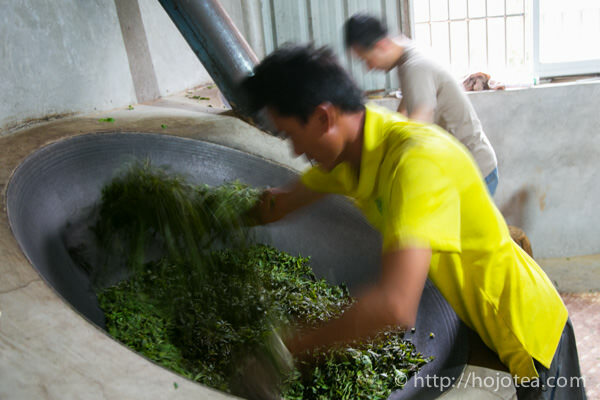 During the production of ripe pu-erh tea, the initial step is to process the fresh tea leaves into raw pu-erh which is not immediately transformed into ripe pu-erh tea but will undergo a process called post fermentation. Firstly, the raw pu-erh tea is piled on the ground and water is sprinkled over the tea to initiate the microbiological fermentation. 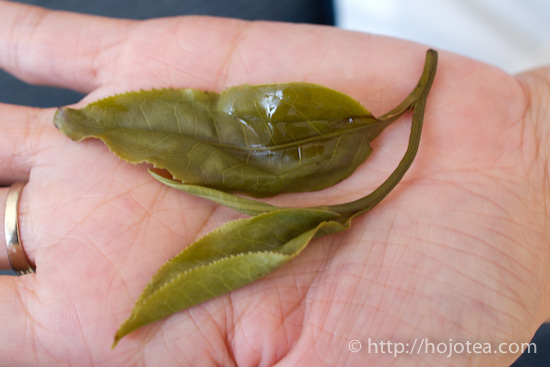 The moist tea leaves are then covered with sheets in order to maintain the humidity. 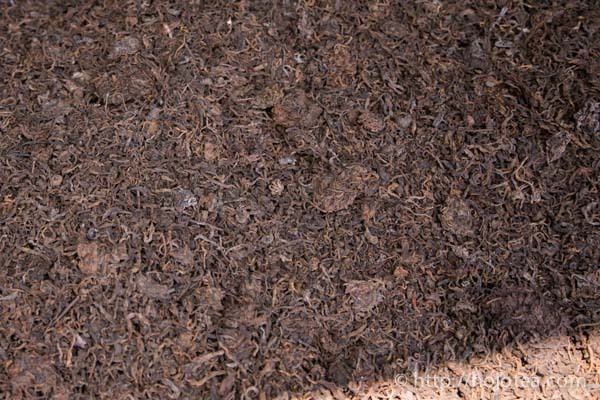 In this stage, bacteria such as actinomycete, will concur and nurture the fermentation process resulting in an increase in temperature that could reach up to 70-80 degree Celsius (peak of fermentation) within the pile of tea leaves. Once a week, the sheets will be opened to mix and even out the moisture within the tea leaves. Several weeks later, when most of the substances are converted, the fermentation process is stopped. Naturally, the temperature also decreases. This is the 1st stage of fermentation. 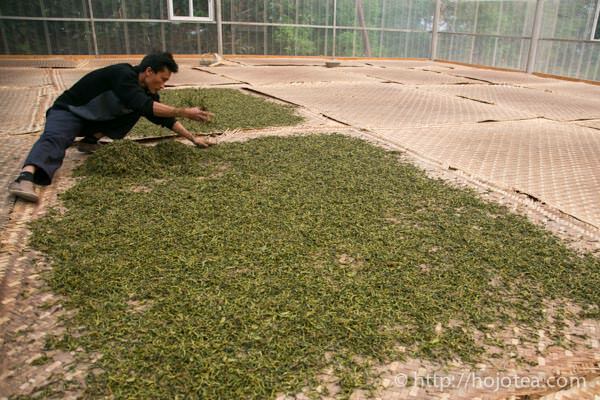 The tea leaves are then spread over the floor with the thickness about 200mm. During this process, yeast and mold dominates the fermentation causing the tea leaves to gradually lose their moisture, simultaneously, the appearance of mycelium of mold occurs on the leaves. This process has two objectives which are the drying of tea leaves as well as yeast and mold fermentation. 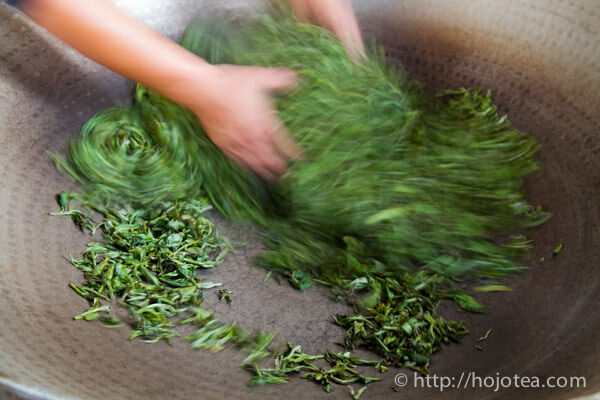 However, if the tea leaves are piled too thick or dried using hot air, the tea flavour will diminish. 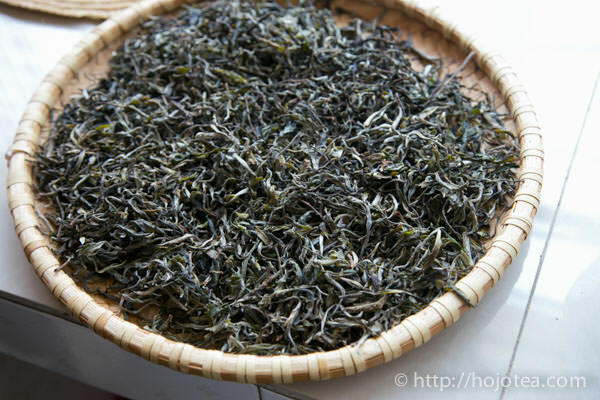 During the secondary fermentation, due to the coagulation caused by the mycelium of mold, lumpy tea leaves are formed. The size of cha-tou is approximately 10-40mm whereas the shape is inconsistent. This is called “cha-tou” in Chinese which literally means the “tea head”. Once the cha-tou is formed, the moisture trapped within the leaves will undergo a certain fermentation or maturation that will produce a dried-fruity flavour which inspires manufacturers to cherish it very much. Therefore, it is one of the most expensive and limited tea among ripe pu-erh teas. You can see many lumps of tea that appears at random. This is the most precious ripe pu-erh for the manufacture, called cha-tou. Some customers have skeptical views on pu-erh tea. 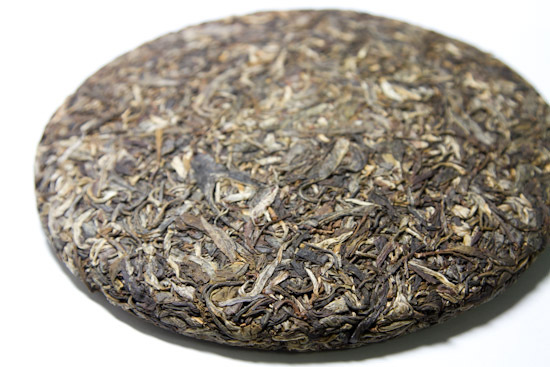 Normally, they dislike pu-erh mainly because of the moldy flavour which is caused by the poor quality of the tea. The earthy flavour in pu-erh tea does not only give an unpleasant drinking feeling, but also causes health risks. This defect that occurs in pu-erh is mainly due to the improper fermentation conducted under the wrong conditions, and therefore the incorrect type of mold or bacteria was cultivated. Some ripe pu-erh tea produces flavour like dried squid or like smelly feet. That odour present due to the contamination of bacteria which is caused by the improper fermentation process or drying process. Logically, any smell that we don’t appreciate is what our body does not require. For health reasons, it is not advisable to drink earthy or foul smelling pu-erh. To identify good quality ripe pu-erh, it has a flavour that is similar to dried Chinese dates or other types of dried fruit flavours. The variety of flavours mainly depends on the fermentation technique, and sometimes, the specific type of cultivar also contributes to certain flavours. These principles are not only used for pu-erh tea, but also for all kinds of teas. Basically, we use the following 5 criteria to inspect the quality of tea. It is quite difficult to completely understand the meaning of after taste. In general, it means the taste that is felt in our throat and lingers; it gives depth to the taste. In other words, perhaps the closest term to describe this drinking feeling is “aftertaste”, “depth of taste”, “softness”, “smoothness”, “thickness”, “lingering taste”, “long lasting taste” or “long finishing”. Whereas in Chinese, it is called Hou-yun　(喉韻）, Hui-gan (回甘), Cha-wei (茶味)，or sometimes Cha qi (茶気）. “Hou” means throat and “Yun” means lasting lingering charm. The intensity of after taste is induced by the minerals contained in the tea. The body is often misunderstood with “after taste” or sometimes with physical texture. 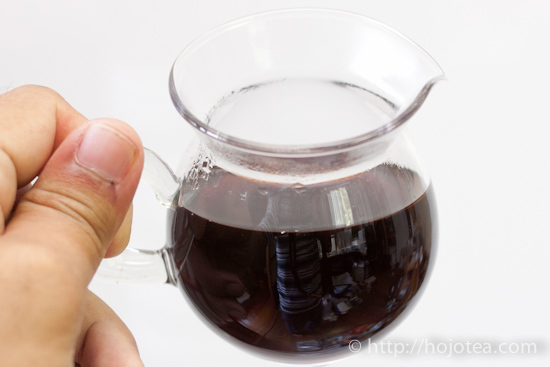 For example, ripe pu-erh tea looks thicker than raw pu-erh, orange juice looks thicker than apple juice or red wine looks thicker than white wine. However, it is nothing but the physical texture. The body is the different subject. The other terms to describe the meaning of body would be fullness, weight, width of flavour, roundness, total mouth-feel, and the concentration of flavour that spread in the mouth. When tea has stronger body, we can enjoy more intense flavour and richer mouth-feel. The flavour is much more out coming with the body. Our experimental results showed that the presence of alkaline minerals such as Calcium or Potassium contributes to the body of tea. For us, flavour defines the characteristic of tea which we cannot compare the superiority. Descriptively, flavour is like the colour of a photograph where different brands of camera or lens produce different outcomes in colour. Somehow the colour does not define the quality of the lens or camera. We usually appreciate the depth and “bokeh” effect that creates a three dimensional visual impact to the photograph. Similarly, the after taste and body affects the depth of taste and the feeling that continuously lingers in our throat. During our tea screening and selecting session, our main focus is the intensity of after taste and body. After short-listing tea with good after taste and body, only then we will move on to the next round of selection which is based on its flavour. Flavour does not set the quality of tea, but its character. 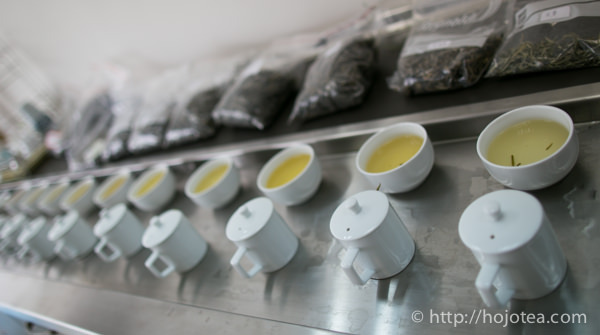 While selecting pu-erh tea, we choose the tea through a screening process. 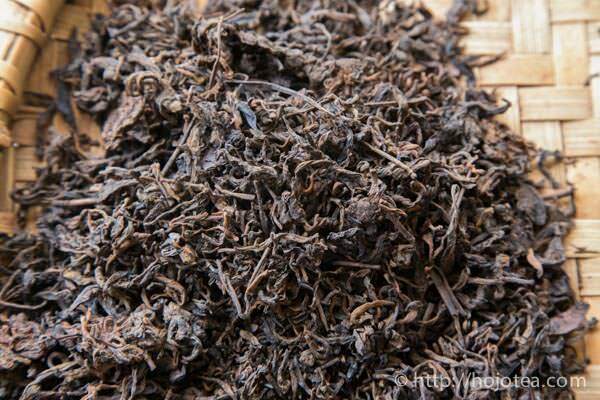 The pu-erh tea that indicates improper fermentation especially the ones with unpleasant flavour such as moldy, earthy or dried squid flavour will not be considered but eliminated immediately. Everyone wishes to buy the perfectly-processed tea. Well, under normal circumstances, the perfect tea’s price will not be low. If the selling price is drastically reduced due to the minor defects, sometimes, some of us will not mind. When considering the decision of whether or not to purchase the tea, I will usually weigh between the defects and the selling price. We drink pu-erh tea not only when it is fresh, but also after the aging. For the certain type of defect such as over pan-frying, the unpleasant flavor will be extremely unnoticeable once the tea is matured. We consider to purchase it if the price is right and the tea has strong body and after taste. These teas are good for aging. 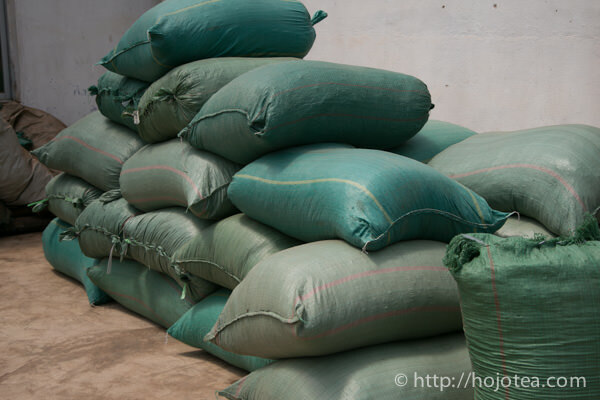 This is referred to the condition of tea during the storage, logistics and handling process. Regardless of, tea is made of good material and is well-processed, if the tea is not appropriately kept, it will be oxidized and will produce a stale flavour. 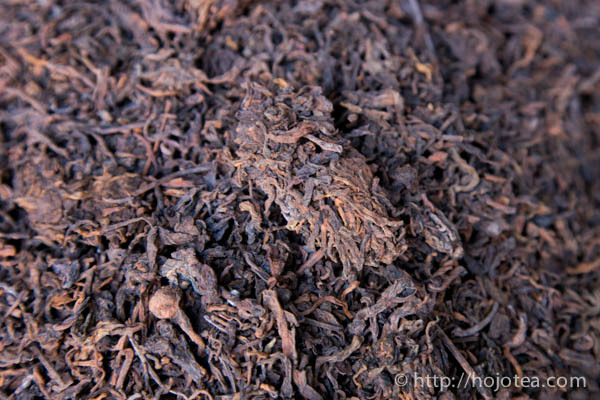 Some may assume that pu-erh tea does not get oxidized but it is not true. The well-matured pu-erh tea gives a very sweet fruity flavour that is similar to sugar cane, honeyed-fruit or dried fruit flavour, however, the oxidized pu-erh tea gives an earthy or stale flavour, though many people cannot identify the oxidized flavour of pu-erh tea. Above all, I think that the after taste and body is the primary factor to define the overall quality of the pu-erh tea. If the seller knows the tea very well, the price of the tea is basically in proportion to the intensity of these criteria, unless, the tea has a lot of deducting points on defects. Under the circumstances, one must know how to detect the after taste and the body. Unfortunately very few people know how to determine the after taste and the body. If one does not know how to appreciate the after taste, there is no choice but to depend on the “brand”. This is the reason why many people look for the tea that is produced from famous factories. 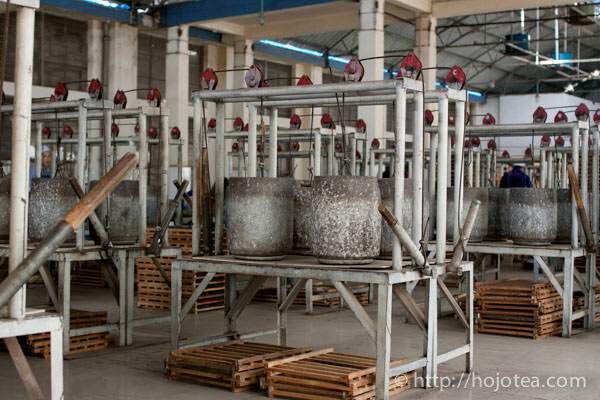 In fact, big factories can hardly produces high quality pu-erh tea due to the limitation of the raw material. The intensity of the after taste and the body is defined by the quality of the materials. Therefore, the processing of tea does not affect the after taste at all. As long as the tea leaves are of good quality when harvested, the after taste should be pretty good regardless how terrible the tea is processed. On the contrary, regardless of the length of storage duration or how good the tea processing was, the intensity of the after taste and the body will never improve if the raw materials are not of good quality. 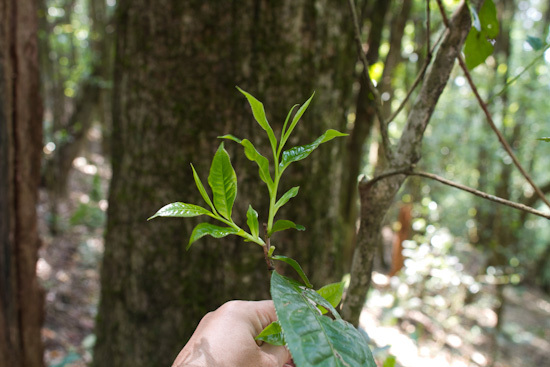 How do we determine the quality pu-erh in Yunnan? First of all, understanding the essential factor that creates the strong after taste and intense body is the key. The after taste and body is influenced by the minerals contained in the tea, such as, iron ion which produces a tea with good after taste, whereas the body is influenced by the alkaline mineral such as calcium and potassium. The question is how to find a tea that is rich in ideal composition of minerals and organic substance. In order to look for the ideal quality, we should first know the logic. In Yunnan, there are thousands of pu-erh teas which makes it impossible to taste all the tea one by one. So, we usually set a list of criteria and select the tea accordingly. Do find the following criteria helpful as we always use it when we look for quality pu-erh. A higher altitude is good not only for pu-erh, but also for all kinds of tea or even vegetables and fruits. 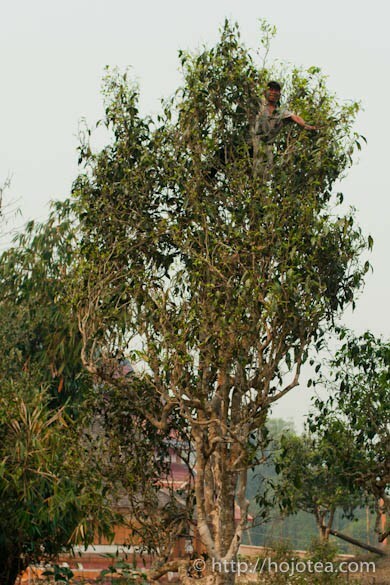 With the benefit of high elevated land, the tea trees are able to receive stronger sunshine during the day and cooler temperature during the night. Under such extreme weather conditions, the tea leaves are able to produce more substances and preserve them due to lesser consumption during the night. Ultimately, tea gives a very rich flavour and strong in after taste. a number of quality pu-erh teas. 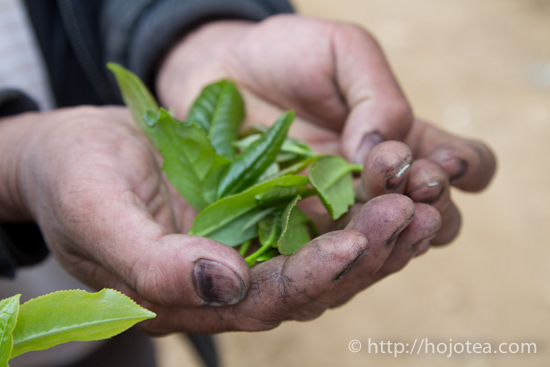 The mineral composition in the soil affects the after taste and the body of tea. Identifying the type of solid when we visit the production area is the first assessment of the quality. 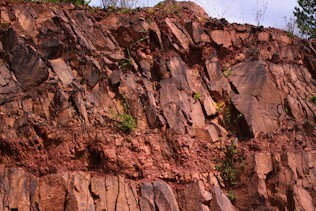 In addition, there is another important condition that contributes to the red soil factor. On the mountains, there are plenty of fallen leaves from the native trees that accumulate on the ground. These dry leaves also carries a lot of minerals which when time goes by, they will be decomposed by the microorganisms present. When rain falls, the remains of the decomposed leaves will be soaked by the rain water and will eventually blend into the soil. The tea trees will then absorb extra minerals at a faster pace. Due to this reason, mountain tea always produces better after taste compared to garden tea, unless, the garden tea is planted at extremely high altitude. The tea plucked earlier in the season always produces better quality, while the 2nd or 3rd plucked tea cannot be as good as the 1st plucked tea. There is another practice that affects the quality of the tea. If a tea tree has been plucked too many times in a year, it will not produce good quality tea leaves in the upcoming year due to the insufficient mineral content. But, if the tea leaves are plucked only once during spring, there will be sufficient time for the new grown tea leaves to accumulate minerals throughout the year. As a result, the tea produced in the following year will exhibit a very strong after taste. 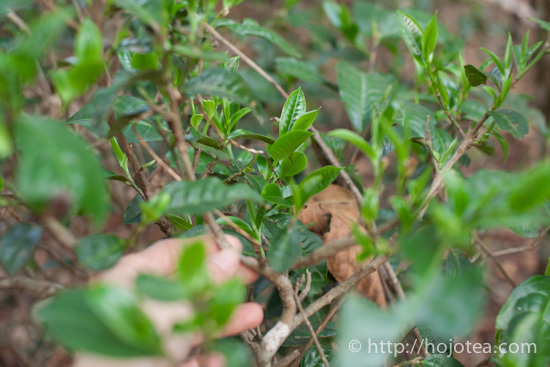 If tea plucking is continued throughout early spring, late spring, summer, early autumn and late autumn, the tea tree has to work harder in order to produce new batch of leaves. Eventually the tea tree is overworked and fewer minerals remain inside. This problem becomes noticeable especially when the tea becomes popular in the market. Back in the year 2006-2007, the pu-erh tea had reached its peak due to the high market demands that increased dramatically causing farmers to sell pu-erh tea immediately after production. On the average, the tea was plucked twice a year, but during those peak years, the tea leaves were plucked throughout the year. Therefore, the tea that was harvested in the year 2008 produced less aftertaste. 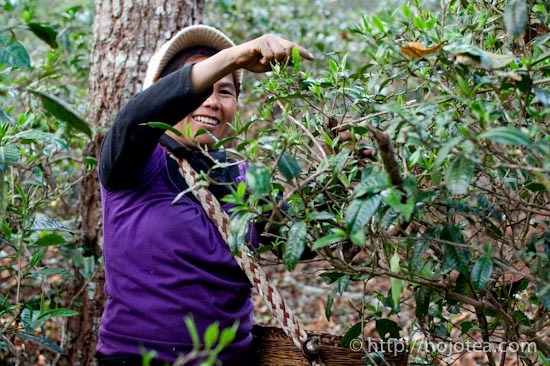 In Yunnan, the age of a tree is considered as a very important factor to get tea with good after taste. The root grows deeper when the age of the tree gets older. With a longer root, the surface area of the root increases, hence, the ability for the tree to absorb minerals from the soil is increased. 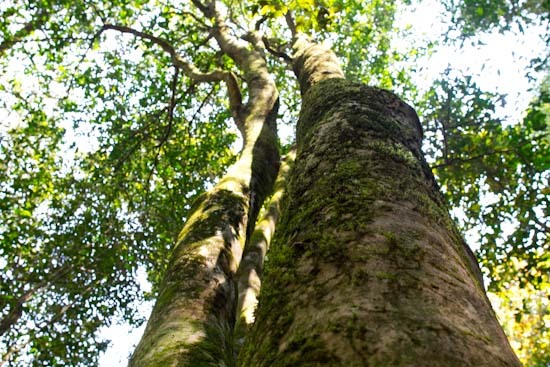 Logically, bigger trees do not have to grow fast since they are tall enough to acquire sufficient sunshine. As it is, the old tea tree grows very slowly thus undergoes less photosynthesis which instead produces very rich functional substance called polyphenol. 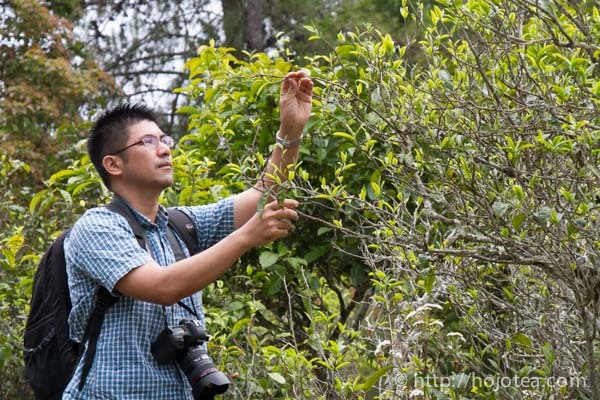 In Yunnan, the tea trees are classified into 4 different categories, they are as follow. It is me who is on the tea tree. Literally, it is the tea made from the tea garden. 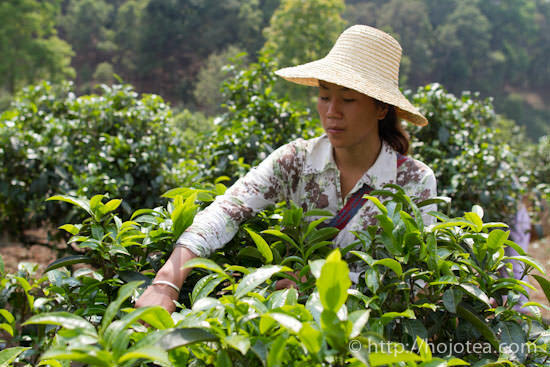 In Yunnan, the history of garden tea is short. 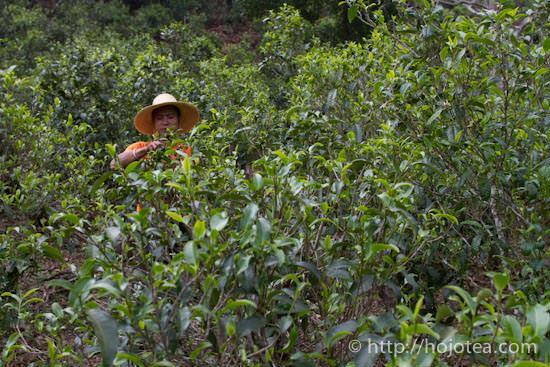 Generally, the majority of ripe pu-erh is made from the garden tea. 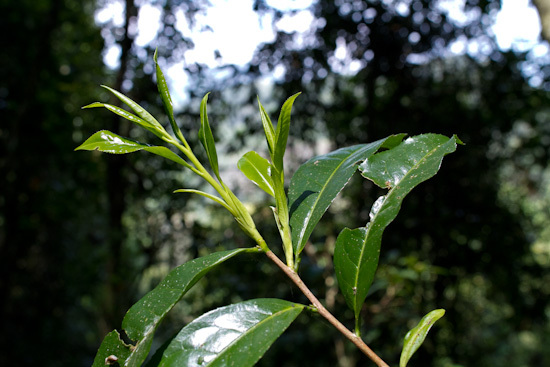 Relatively, garden tea produces weaker after taste in general, unless, the garden is situated at a very High Mountain such as the altitude at 2000m. 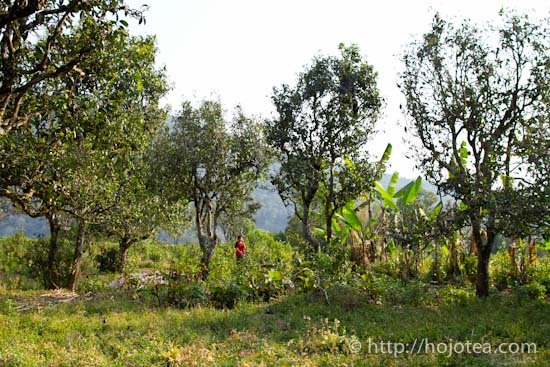 Tea trees grow on the mountain and the age of the tree is around 100-200 years old. 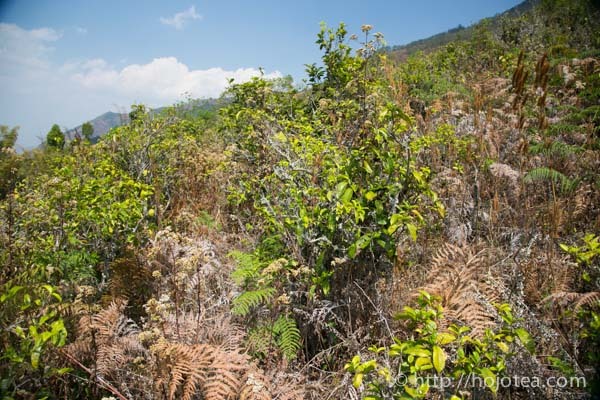 The tea trees are planted on the slope of the mountain in between wild-grown native trees. Generally, the after taste of tea from this category is much stronger than the garden tea. This type of tea is superior to that of the garden tea not only because of the age of the tree, but also thanks to the minerals provided by the fallen leaves from native trees and grass from the native plants growing around the surrounding environment. 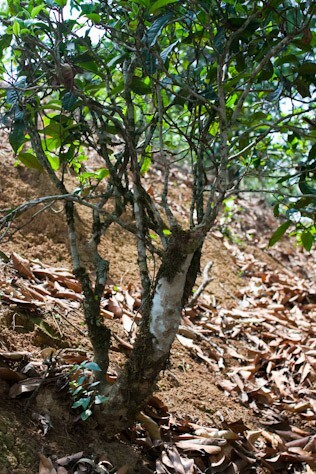 This is referred to the tea that has aged a few hundred years and more which are growing on the slope of the mountain. The teas in this category are considered as the best raw material in Yunnan where it is believed to give a strong after taste. But unfortunately, the price of these teas tends to be very high. Due to the limited supply of leaf from the old tree, the availability is very limited. In any case, old tea trees do not guarantee the best quality. 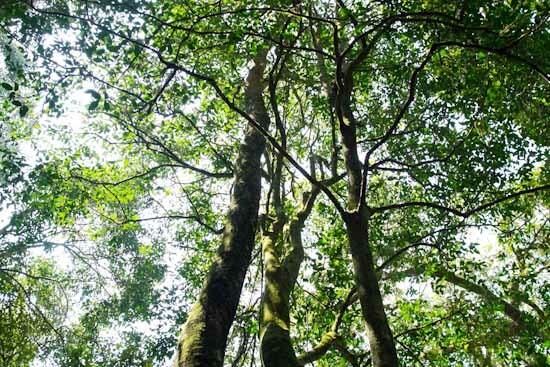 There are genuine wild trees available in Yunnan. 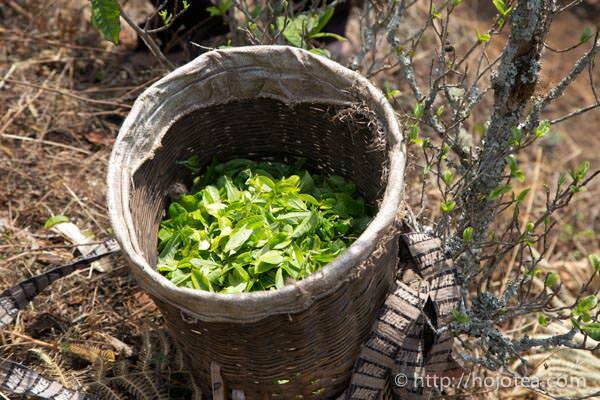 The wild tea consists of various types in terms of leaf size, shape and not to mention the taste and flavour. These varieties are made from natural hybrids. Generally wild tea gives a very strong after taste and sometimes even some extent of bitterness.Wild tea is referred to the native tea trees grown deep inside the forest. I guess you must have seen teas that are labeled as “wild tea” (野生茶). However, many of those acclaimed “wild tea” tend to be nothing but from an ancient tree. People often call it “wild” as the tea was planted in the mountains. 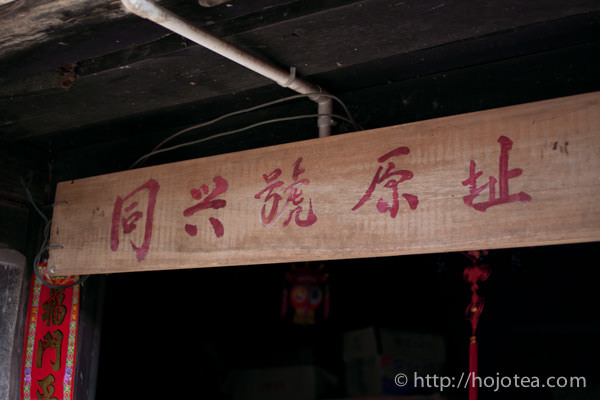 In Yunnan, this terminology seems to be frequently applied in the tea market in order to simply attract customers. Here is the video introducing the wild tea tree. We think that the most important factor that affect the quality of the tea is the way how farmer grows the tea. Their agricultural practice affects the quality of tea more than anything else. 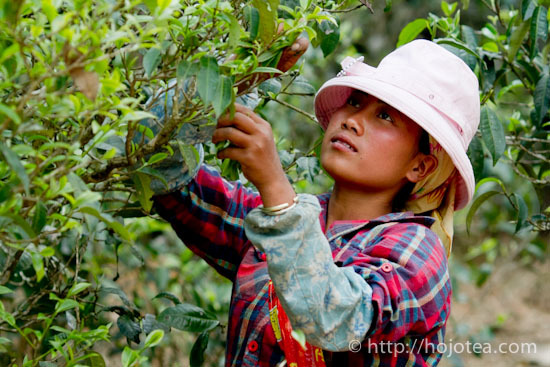 For thousands of year the minority people of Yunnan practiced an ecological farming. They treated tea as a part of the ecology and did not give any special treatment. It was the wisdom of their ancestor to keep tea as healthy as the wild plant. However their practice is beginning to change in a past 30 years. Many farmer in Yunnan start shifting from the traditional practice to the modern agricultural method. If we wish to gain any health benefit from tea, tea by itself has to be very healthy too. That is the reason why I spend nearly a month traveling in Yunnan every year. I cherish the eco-friendly farming and I am always searching for it. It is important for the tea to grow as naturally like wild plants despite me mentioning a few factors that will affect the quality of pu-erh tea. 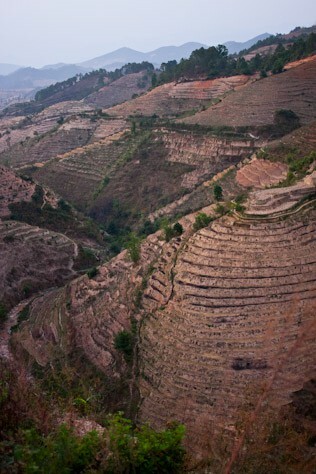 Even in Yunnan province, the majority of tea is grown with fertilizers and some herbicides. In the village, a farmer often showed me the organic fertilizer and implied how natural their tea growing method was. However, none of the wild plants in the forest required the fertilizer regardless whether of it is organic or inorganic. 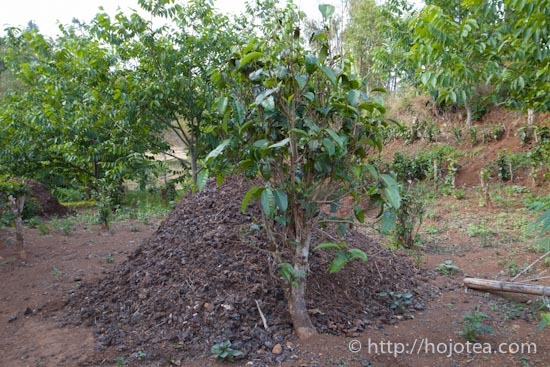 In a way, growing tea with organic fertilizer is “very unnatural”. The thing is, the tea will grow faster and become unnaturally bigger and greener if any kinds of nitrogen based fertilizer is applied. 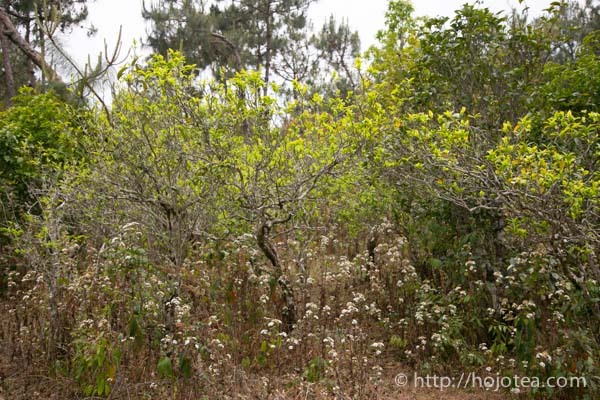 Although the wild plants in the forest are not provided with any fertilizer, they have adequate intake of nitrogen. The secret is the soil. In the soil, there are a number of bacteria and other organisms forming a big ecology. For example, the species of bacteria called “rhizobium” has the ability to ingest the nitrogen from the air and supply for the plant. 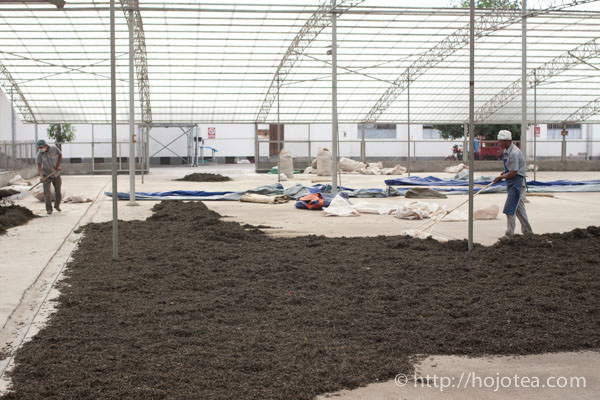 In order to retain those friendly bacteria for the plant, it is essentially important to keep the weeds on the ground. Once the weeds are removed or eliminated by the herbicides, it will destroy the underground ecology. With minimum intake of nitrogen from the nature, the tea tree grows at a very slow speed which will then accumulate a lot of polyphenol and be rich in minerals. 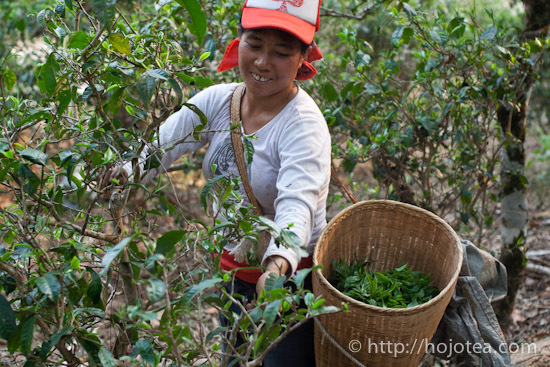 HOJO is particularly interested in the pu-erh tea that is grown with natural farming methods. These teas consist of small and yellowish leaves. The following photos show the tea tree and leaves that grown very big size and green color due to the excess intake of fertilizer. Tea tree happens to grow right next to the organic fertilizer. The leaf grown unnaturally big. As the trend in Yunnan, the farmer starts modernizing the agricultural practice in order to increase the production quantity once their place became famous and people start visiting. 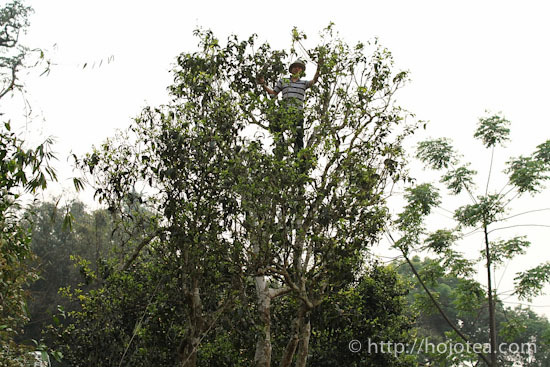 In those famous tea areas, it is a very common practice where farmers often chop off the middle part of tea trees. 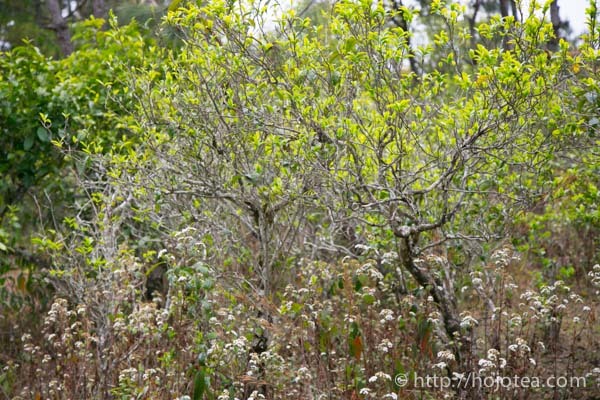 Once the tea tree is chopped, it starts to produce young shoots that will soon grow upwards. Its growth is faster which will eventually produce more leaves compared to the old trees, which are kept unattended. Unfortunately, those pruned or chopped tea trees cannot produce tea with good after taste since the minerals and various substances are absorbed by the growing young shoots. 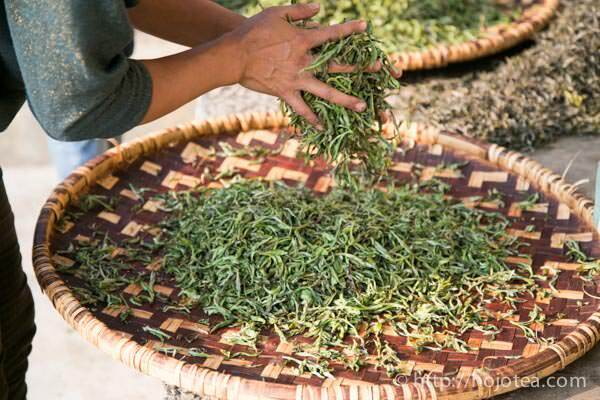 Usually, the slower the tea tree grows, the better the taste and flavor the tea leaves produce. 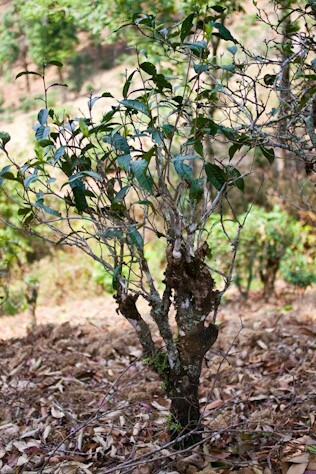 Although the bottom part of the tree including its root is maintained as an old tree, the quality of its tea leaf produced has much lesser after taste compared to the young tree. Old tree: its middle part was chopped off. Old tea tree where its middle part was chopped off. Just like wine, the quality of tea varies a lot depending on the year of production. For the green tea and green oolong tea, we have to consume it within a year since we cannot preserve the tea. However, for pu-erh, we can store it as long as we wish to. Hence, it is meaningful to know which year is the “quality year” so that you will be able to purchase and stock up a little more tea which was produced in a good year. As mentioned before, the slower the growing rate, the better the quality. In other word, if a tea tree grows slower, its tea leaves will have a better chance to accumulate minerals and organic substances to be absorb for growing purpose. 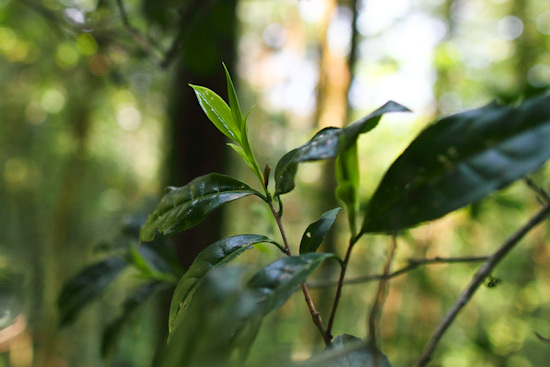 Tea trees grow at night, while flavor and taste is produced during the day and is able to continue producing flavor and taste as long as sufficient sunshine is provided during the day regardless of whether it grows or not. Growing means consuming. The quality of tea becomes better if the tree grows at a slower pace. The same theory applies to the fruits where the taste will be very thin and less sweet when plucked during a rainy day. It is not caused by the sweetness being washed away, but, by the consuming of the fruit’s sweetness by the tree since trees grow faster during rainy days. Generally, dry and sunny weathers are ideal for producing good quality tea since tea trees absorb a lot of sunshine to conduct photosynthesis. During dry weathers, the temperature at night tends to be very low due to the radiated-cooling phenomenon. In addition, the semi-draught weather also provides less rain resulting in a slower pace of tea tree growth. Same goes for tea, where there is more rain during spring, the quality of the tea will not be good since the growth is faster when sufficient water is provided. As a result, the taste of the tea gets thinner and has less after taste. Yunnan is one of the provinces in China yet its area is even bigger than Japan. The weather in Yunnan is not constant and varies in different areas. 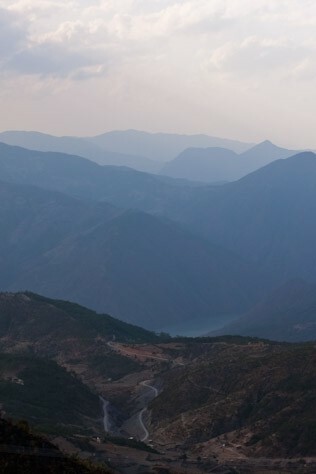 The Southern part of Yunnan is much influenced by the weather of South East Asia, while South West and West Yunnan is affected by the continental weather. 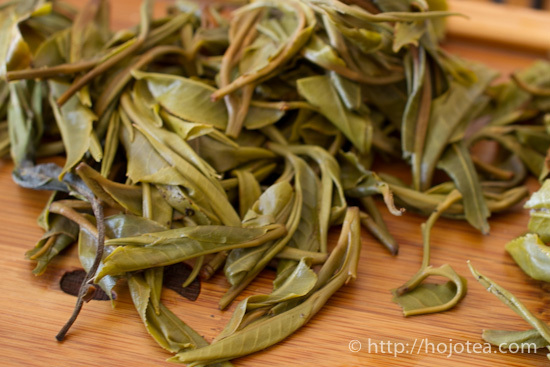 Hence, we cannot conclude which year is the best for all Yunnan teas. The quality year for each manufacturing area is different. For example, Xishuang Banna was hit by a serious drought in 2010 which caused a reduction of 1/3 in the tea production total output in a normal year. Subsequently, the lower output brought up the overall quality of the tea although the price increased. 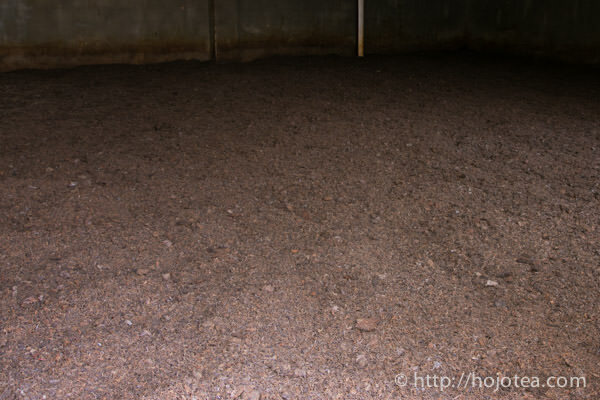 Storing raw pu-erh tea is one way to enjoy it as fermentation will slowly take place during storage. Initially, the colour of raw pu-erh tea leaves is yellowish green. It will then gradually changes from yellow to amber. In addition to the changes of colour, the flavour also changes a lot. 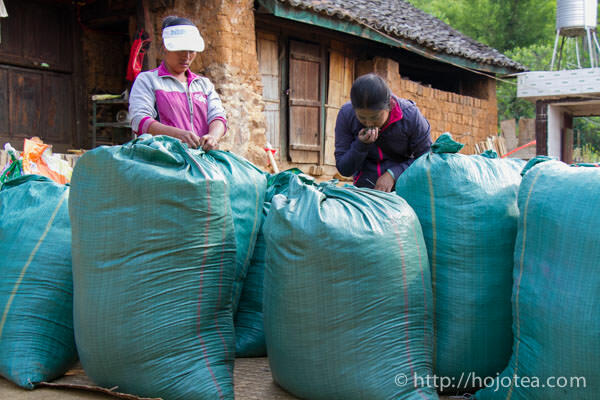 In fact, the maturation of raw pu-erh is similar to that of haystacks that also generates sweet aroma after being kept for a few years. 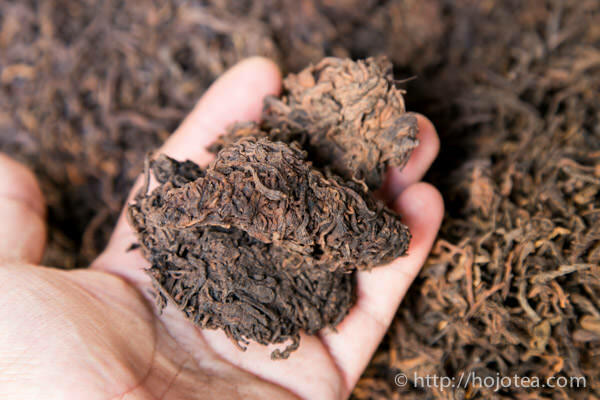 Contrarily, if I would to take an example to explain ripe pu-erh, I will use the process of “compost” to describe the process since both compost and ripe pu-erh are made from the fermentation of bacteria and mold. 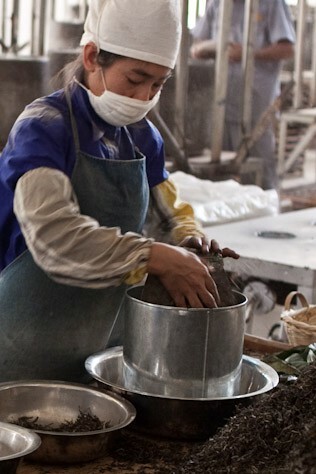 The character of the ripe pu-erh tea does not only depend on the raw materials but also the use technique of microbiological fermentation. We do not have to be so particular about the length of storage. 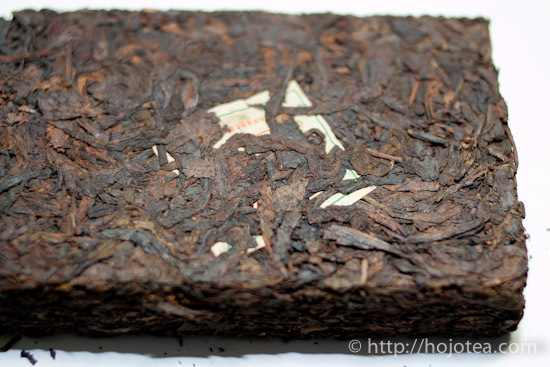 A well-made ripe pu-erh tea gives a very pleasant character even if it is merely one year old. Is the Quality of Vintage pu-erh better? 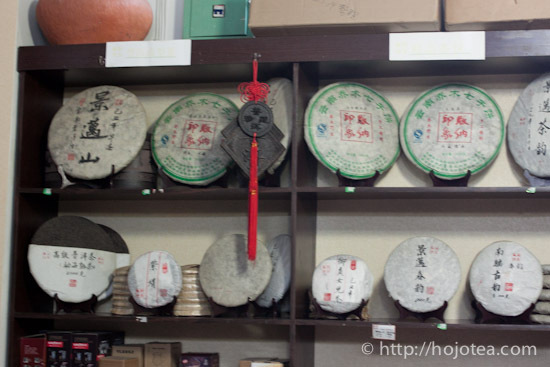 There are tea collectors who always look for vintage pu-erh made by famous factory. There are some pu-erh teas that cost even more than USD1000 per piece. Since it is so “expensive”, many customers wonder how good the vintage pu-erh would be in taste and flavor. Technically, the quality of tea itself never changes even if it is kept for 10 or even 30 over years. In fact, the intensity of the after taste and the body remains exactly the same as the freshly produced tea. This is because the intensity of after taste has something to do with the minerals. The storage does not affect the minerals, but the organic substances present. Based on an experiment conducted by us which was done by burning the tea leaves into ashes and observing the improvement in taste of water, the result attained had no modification or variance in the after taste of water, meaning that the intensity of the after taste of water before and after burning tastes the same. The key element that influences the taste of tea is based on the minerals. Although the aging of tea does not improve the after taste, it creates a variety of flavour and makes the taste mellower or gentler on the tongue. Generally, the raw pu-erh tea which was kept for 1-3 years produced a flowery-honey flavour whereas the 3-5 years old tea gave a fruity flavour which with further storage will change its flavour towards a dried-fruity flavour. As a conclusion, the aging of pu-erh is to satisfy an individual’s preference. Based on our experience, young people and ladies generally prefer less aged pu-erh, while the elderly people prefer a more aged pu-erh. Why are there so many tea collectors who are desperately looking for the vintage pu-erh made by famous tea factories? Once upon a time, the production of tea from respective factories was extremely small. If one has ever visited Yiwu town, we can find the name of famous tea brands that still exist out there “as a sign of each house”. In the old days, the so-called tea factories were just like individual farmers that produced pu-erh tea in small scales. Nowadays, those factories are no longer producing good quality teas compared to the past as they do not have a choice since the mission of the factory is to maintain high output. In the past, especially after 1949, the communist government prohibited the ownership of private business which is why the old housing brands owned by individuals were seized and only big factories owned by the government were allowed to produce pu-erh. From 1949 to 1990, several big factories dominated the pu-erh tea production, for example, the four most well-known factories were Kun-ming Tea Factory (昆明茶厂) ， Meng-hai Tea Factory (勐海茶厂) ，Xia-guan Tea Factory (下关茶厂) ，and Lin-chang Tea Factory (临沧茶厂). During this period, those state-owned big factories occasionally produced very good quality batches thanks to many skilled technicians and well controlled raw materials. Before 1970s, there was no “tea garden” in Yunnan. The teas available then were from individual farm owned by the minority races. After 1970 onwards, those tea factories needed more materials to meet the increasing demands of pu-erh tea; therefore, an overwhelming number of tea gardens were developed in Yunnan. 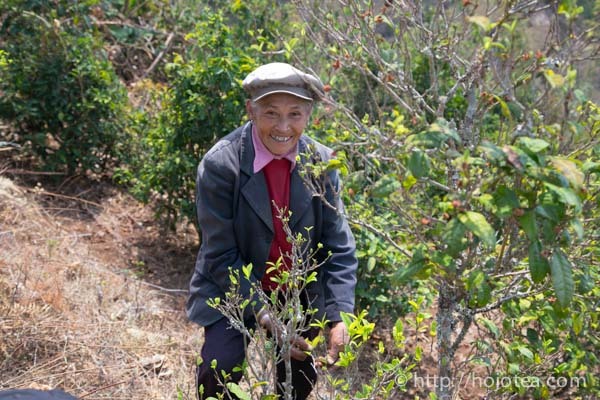 About 40-50 years ago, a skilled technician who worked for a state-owned factory carefully selected and segregated the tea trees according to the mountains and the altitudes. Some batches of pu-erh could have been of very good quality. I came crossed a customer who was fortunate enough to have tasted those legendary good pu-erh teas and deeply believed that it was because of the “age” that made the quality so good. As I explained earlier, it is not because of the “age”, but the raw materials used for those old teas were outstanding at that time. But later on since 1990’s, those state-owned factories were all privatized and divided into several small factories. The most devastating influence was that all the old technicians retired leaving the factories lost its autonomy control on the tea garden in the mountain. 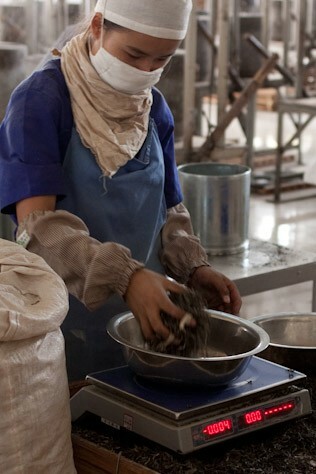 The organizations of tea factories are different now and they no longer produce good quality pu-erh like the old days. 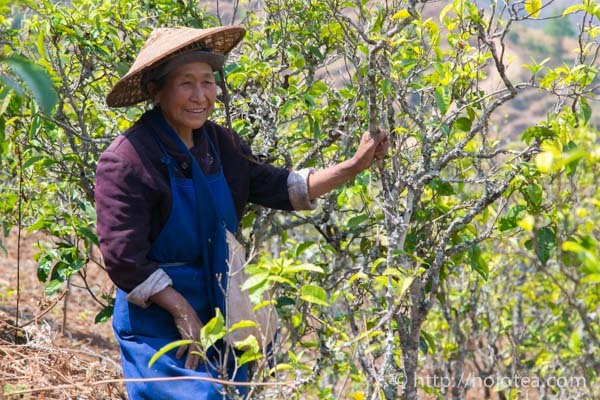 Under the circumstances, the pu-erh tea they produce today will not become the same as those 30-50 years vintage tea even if it is kept for another 30-50 years. I realized that many pu-erh collectors cannot tell the difference between spoilage and maturation as a matter of fact. 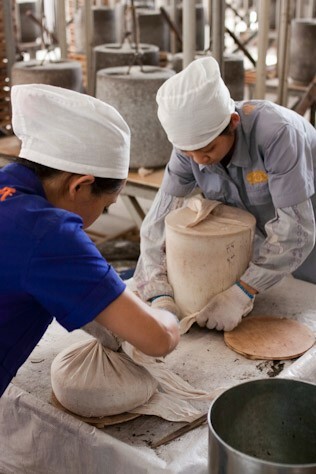 The aging of raw pu-erh requires knowledge and skills. If the tea is simply kept in humid conditions, the tea leaves will deteriorate rapidly due to the excessive moisture in the atmosphere that triggers unwanted oxidation and the growth of microorganism. The tea subsequently produces moldy or earthy flavour which ironically, a lot of pu-erh collectors misunderstood that the moldy and earthy flavour is what a vintage pu-erh is supposed to taste like. From the food scientific point of view, any kind of tea must be kept under low humidity. In fact, we highly recommend keeping pu-erh tea in a tightly sealed aluminum bag where the oxygen is trapped inside the bag providing sufficient condition to mediate further maturation compared to those that are kept in open space. 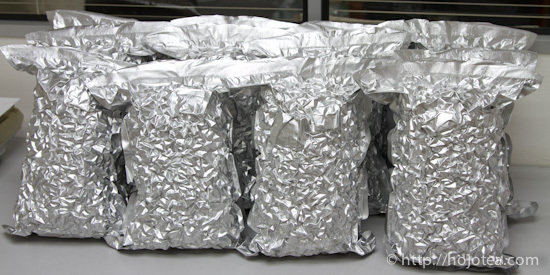 Moreover, there is another way to create a unique maturation method for pu-erh by storing the raw pu-erh in a vacuum-sealed bag even though most people may think this storage method is ridiculous. 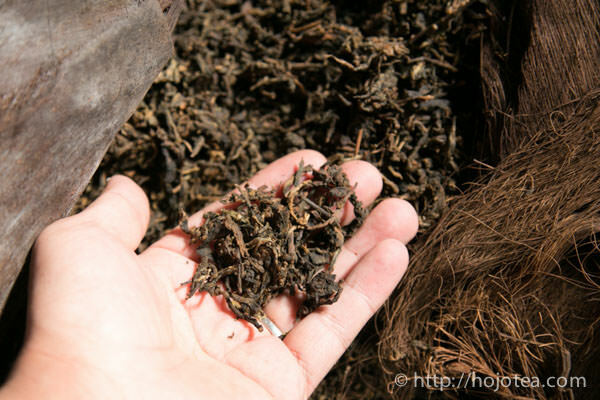 Traditionally, pu-erh tea was compressed to remove oxygen from the leaves and keep it intact. It was the wisdom of the ancient people to keep tea without oxygen and let it matured perfectly. In chemistry, oxidation does not only refer to receiving oxygen. Oxidation also takes place when it releases hydrogen and receives electron. Even if tea is kept without oxygen, it will still undergo oxidation. In the 1960’s, generally pu-erh tea was compressed tightly and shaped like a bing (flat and thin round cake) which was called an “iron bing” (铁饼). This method of compression succeeded in eliminating the oxygen from the tea leaves. The tea leaves were compressed so tightly that it became like a piece of stone; we can hardly pry it even if we used the proper tool that was designed for prying the pu-erh cake. If you have ever tried this kind of pu-erh iron bing, you would agree that it was very well-matured. It produced flavour like honey with fruity note and gives no earthy flavour at all. The only problem was that it is so difficult to loosen the leaves from the iron bing that caused damage to the leaves during the process. 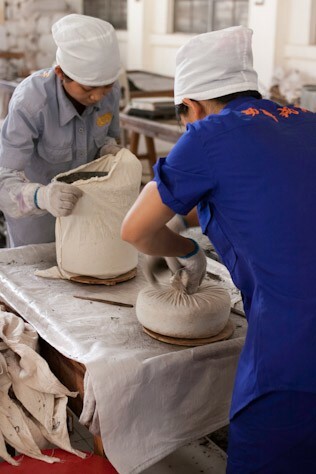 Nowadays, most of the pu-erh tea cakes are loosely compressed making some of them easy to break apart only by fingers. Obviously, there is oxygen present in between the leaves. Thus, if we keep loosely-compressed pu-erh tea in an ambient environment, the tea will be exposed to not only oxygen but also moisture causing it to undergo undesirable oxidation that usually generates earthy flavour. To achieve the same maturation effect like the iron bing, we encourage customers to keep their pu-erh tea without oxygen. With modern technology, we are able to apply the same theory. Some people in Taiwan intentionally store high mountain oolong in a vacuumed bag for a few years. In the beginning, high mountain oolong is green in colour and it gives a delightful fresh flowery flavour. After a few years of maturation, the leaves turn into yellow colour and it gives the flavour like ripen peach or apricot. This is the exact same effect that we are looking for in a pu-erh tea. Based on our experience, well-matured pu-erh tea produces a very fruity flavour and no earthy or moldy flavour at all. 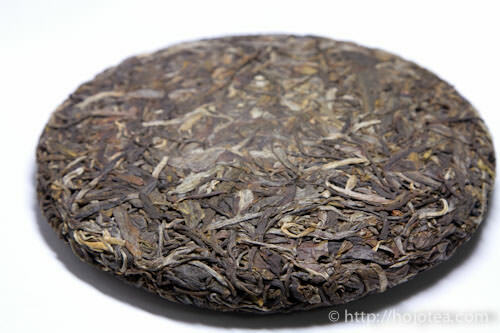 The most common shape of pu-erh tea is round and flat that looks like a piece of pizza. But the original shape of pu-erh tea is in a loose-leaf form, called “mao cha” (毛茶） that shape is just like green tea. 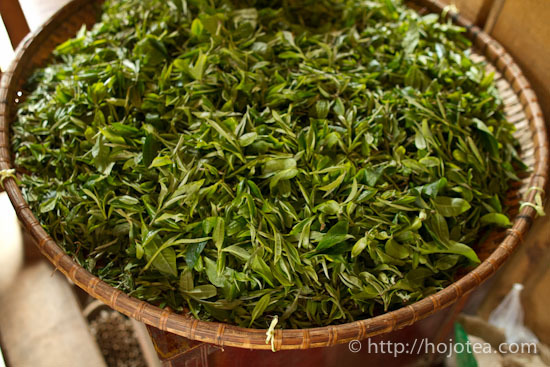 If we are to select tea from manufacturing areas in Yunnan, the tea prepared for tasting is mostly in loose-leaf form. It is the tea merchants like us who purchase loose-leaf and compress it into whatever shape we desire. Based on the original loose-leaf form, it is easier for buyers to judge the quality. Loose tea leaves are subsequently steamed and compressed into intended shapes and sizes for logistic conveniences. The compressed form is less bulky and therefore much easier to carry for long distance traveling. Moreover the compressed form of tea has more advantage in maturation due to the less exposure to the atmosphere. In China, they use 1 Jin (斤) more often than 1kg. This is the standard weight unit in their country. 1 Jin is 500g in China. 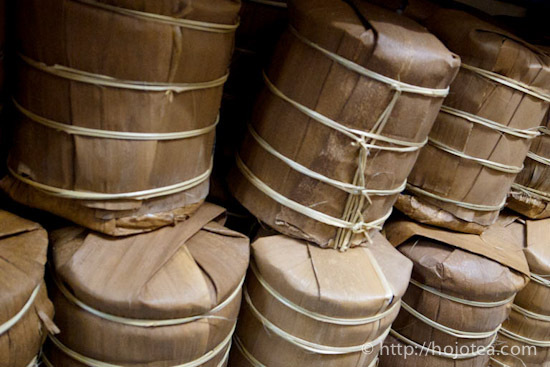 If 357g pu-erh tea cake is stuck 7 pieces, the total weight is 2499g. In Chinese weighing unit, it is about 5 Jin which is very good round number. That is why pu-erh tea cake is called qi zi bing cha in Chinese. That means 7 pieces of pu-erh tea cake. The tea is compressed into various shapes according to the requirement of the clients. Recently, the tea shaped of a very small ball called mini tuo cha is getting popular among tea drinkers. It is small in size like a chestnut and usually weighs about 5-7g in average. Though some people may think that mini tuo cha is of lower quality or lower production standard due to some factories that produce mini tuo cha from broken tea leaves. In any case, the shape of the tea has nothing to do with the quality including mini tuo cha. Usually, we purchase loose tea and instruct the manufacturers to produce the shape we want. In fact, mini tuo cha’s shape come in handy as it is just nice for one brewing and easy to carry around in our pockets; it is also a suitable size for brewing and drinking at our work place. 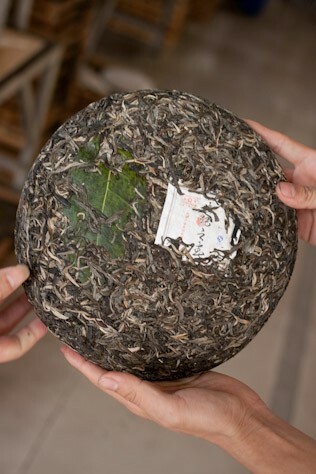 The following photo shows how pu-erh tea was compressed into a pizza shape. Basically, the process takes up to just a minute where the tea is first soften with hot steam, then packed in a cotton bag, and finally compressed immediately. The following photos were taken in a big factory. But the process itself is more or less the same regardless of the scale of production. 3. Steam is applied from the bottom of mold. squeezed and then made into the shape like a piece of pizza. in order to maintain the consistency in shape. A skilled tea maker takes less than 10 secondsto complete it. 6. 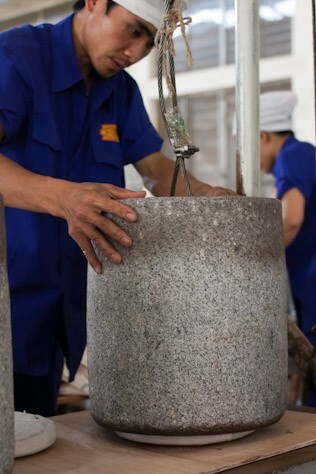 A stone is used to compress the tea leaves. 7. 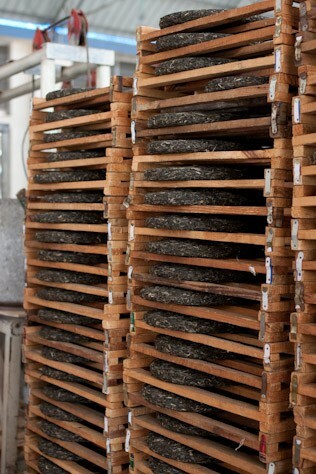 Compressed tea is kept in the shelf and dried. into any shape provided that mold is available. 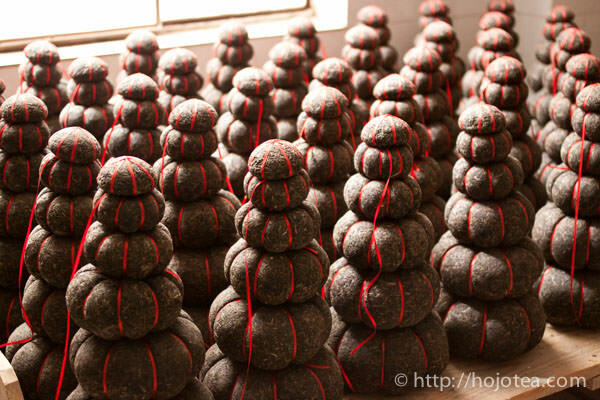 In the market, some pu-erh tea cakes contain a lot of silver tips, especially on the surface. Most people generally believe that the more white downy buds indicate that the tea is of higher quality. 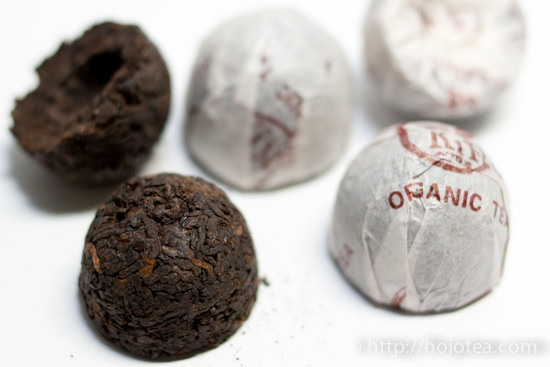 Eventually, many pu-erh tea cakes were intentionally added with white tea for “cosmetic” purpose. One of the factories I visited in Wu Liang Shan area is specialized in producing silver needle for blending purpose. 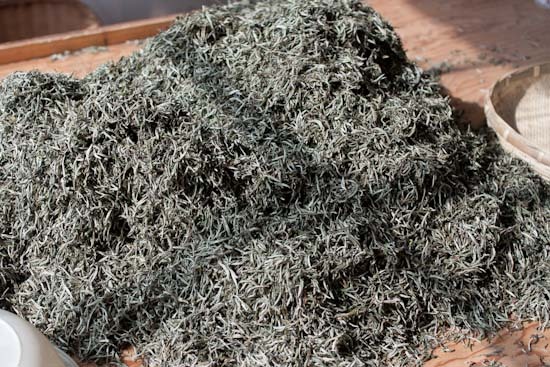 Silver needle is made of tea buds that are covered with the white silver downy. Usually, these silver needles are blending with pu-erh tea leaves, and then compressed into cakes. We should not judge the quality of pu-erh based on its appearance, but instead should based on its taste and flavour. 2. Why are some pu-erh tea smoky? Some raw pu-erh teas give a little smoky scent. Still, it is better if pu-erh tea has no smoky flavour at all. However, sometimes we do accept if the smoky flavour is marginal and with a plus side of a very strong after taste and body. Of course, we will not select a tea that produces too strong smoky flavour. 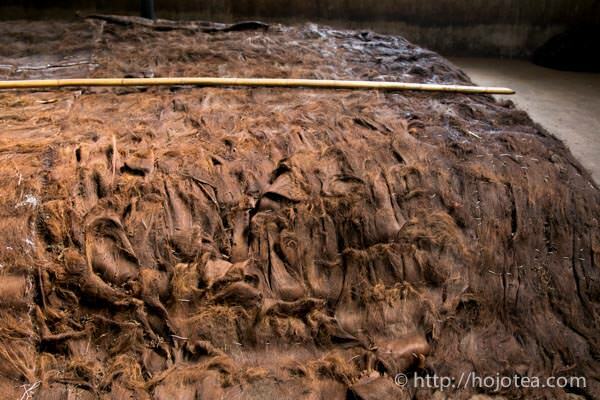 I often come across an explanation that is widely known for the smoky flavour saying that it indicates “machine drying”, while the genuine pu-erh that goes through sunshine-drying does not produce smoky flavour at all. On the contrary, it is not true. 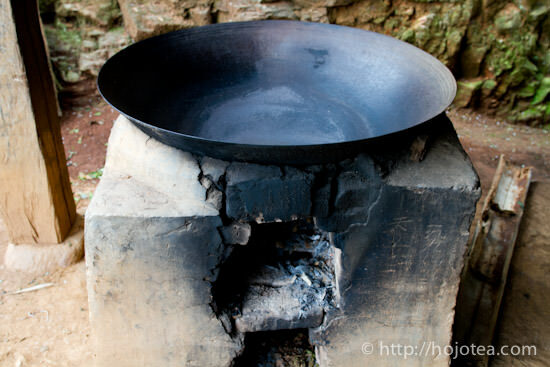 I assume people who never visited the manufacturing site in Yunnan created the above explanation based on imaginations. In Yunnan, no one uses drying machine for pu-erh tea. If a drying machine is used, the enzymes that survived the earlier pan-frying process will be completely deactivated. Eventually, it will not produce pu-erh tea, but green tea. Due to this reason, sunshine drying process is definitely carried out regardless of how big the scale of a factory is. 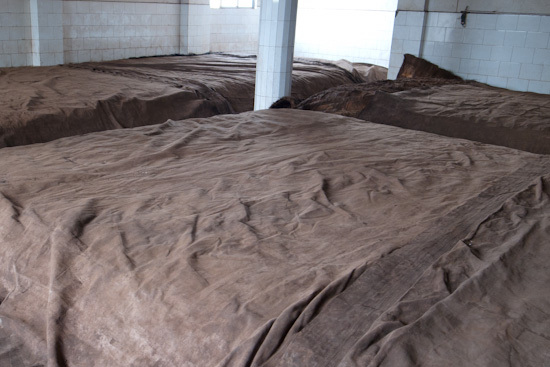 For the production of pu-erh, both farmers and factories conduct sunshine drying. In big factories, they own huge yards allocated for sunshine drying and all the processes are carried out under proper management and supervision. 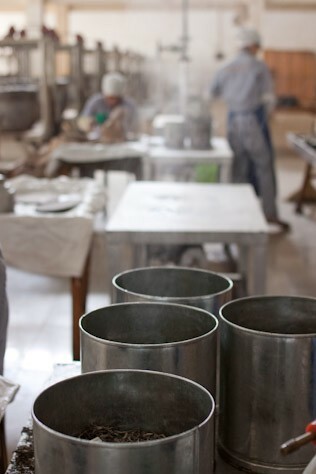 Meanwhile, teas made by the individual farmers are processed on household basis. Farmers who own small facility will first conduct the pan-frying, and later carry out sunshine drying right in front of their houses. 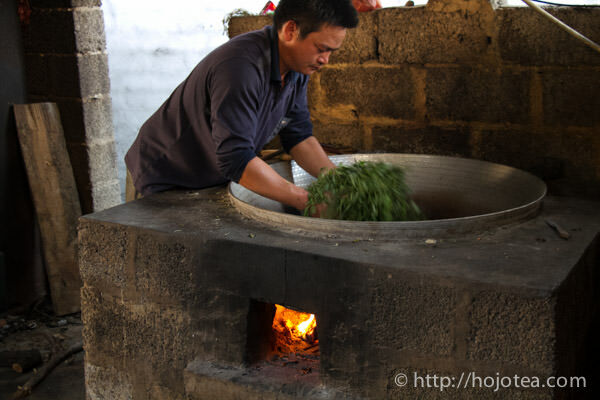 As they use wood fire for cooking and pan-frying of the tea leaves, those teas sometimes absorb the smoke and that is how it gets the smoky flavor. Therefore, we need to balance between the quality and the intensity of the smoky flavor. If the extent of smoky flavor is marginal, it will usually disappear within 1-3 years. The joy of drinking pu-erh tea is that we can indulge and discover different varieties of tea from various ages of tea trees. The taste, flavor and not to mention the aftertaste are precisely reflected from the pu-erh tea’s long history, its growing environment and the people who produce this tea. 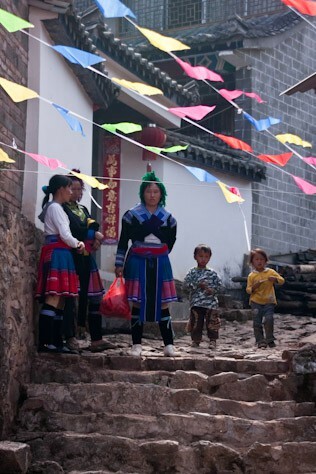 The history, culture, weather and land of Yunnan is concentrated in the pu-erh tea. Another interesting fact about drinking pu-erh tea is to enjoy its variation of flavour through aging. The flavour of pu-erh tea varies as much as we change when time goes by. By customizing the flavour according to your own preference, you will be a part of manufacturing it. It is a delight to serve pu-erh tea of various flavours at different occasions for distinctive guests. Do share these experiences with us by deepening your understanding and knowledge.